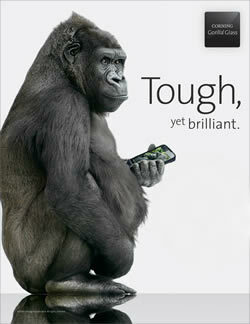 Gorilla Glass….How well do we know it?? With the advent of the new iPhone X, the tech world would line up to perform the stress test on the new phone. 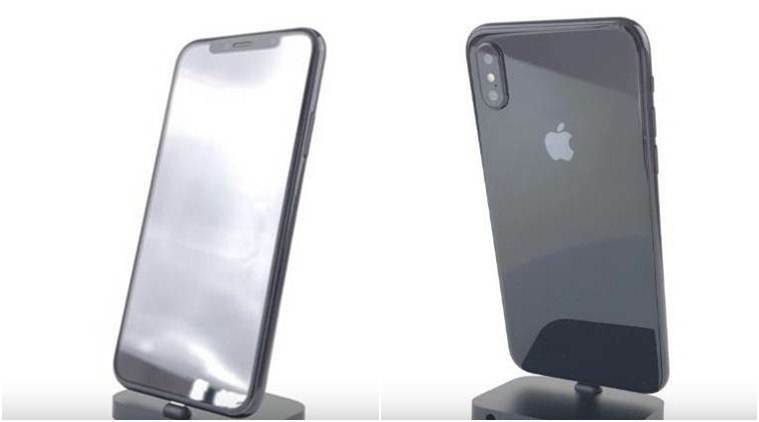 This time around it will be more interesting as iPhone X flaunts a bezel-less/infinity display and has a glass back which allows wireless charging, hence making it more vulnerable than the previous versions. Some of the initial test results have indicated that the phone with a $1000 price tag is as delicate chinaware rather than a day-to-day use item. Now how is the description above related to the topic at hand? In our everyday life, we use many gadgets like smartphones, smartwatches, tablets, laptops etc. which come with their individual display specification. One thing though binds all of them together along with iPhone X – Glass. Glass is the material the used for the display screen. Depending on the functionality that they need to serve the treatment of the Glass varies. One such company which has been at the forefront of developing specialized glass has been Corning Inc. 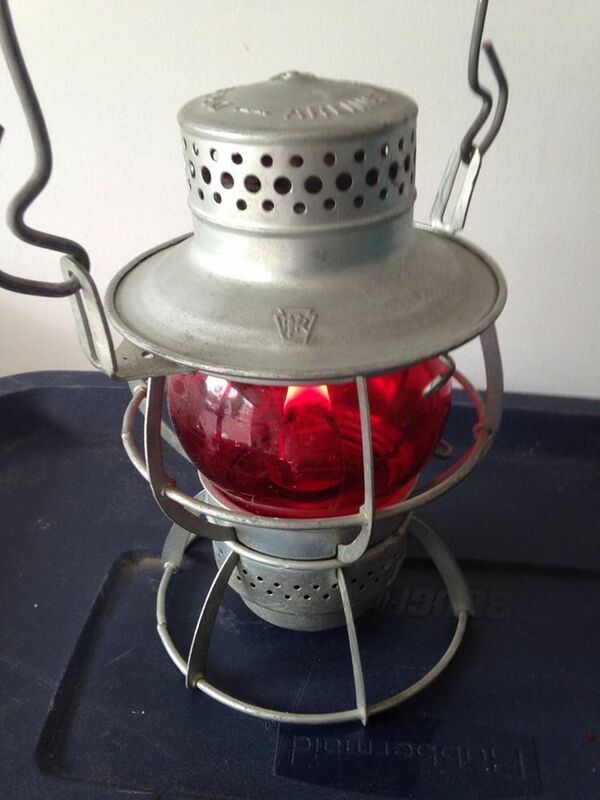 It started its business with innovative Railroad Lanterns as one of its offerings which helped to bring down the number of accident-related deaths. Despite its 166 years long innovation-driven journey, it did not get its due limelight. The turning point came in the year 2006 when Steve Jobs decided to use Corning’s “specialized Glass” for its first iPhone which was to launch in Fall 2007. 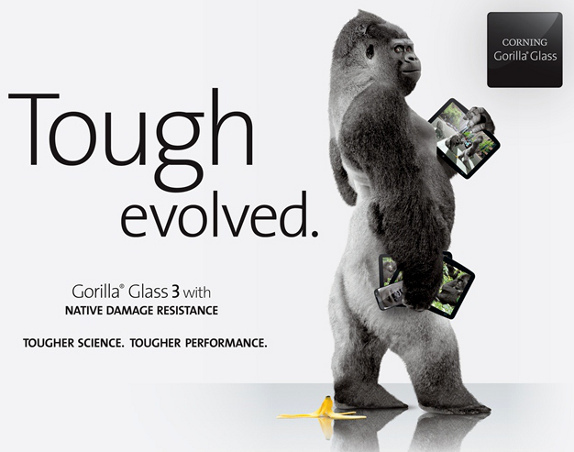 Less than a year later, Corning came out with its specialized tough glass under the brand Gorilla Glass. Today, Corning Inc. boasts of supplying Gorilla Glass to more than 5 billion devices of 40 different Original Equipment Manufacturers(OEM). Along with handheld devices, Corning Inc. has now stepped in with a solution for automobile windshields. 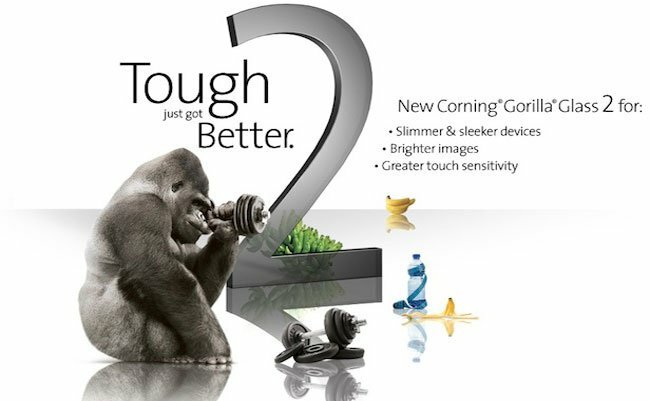 So now we know a little about Corning Inc., but do we know anything about Gorilla Glass? Why is it tough? 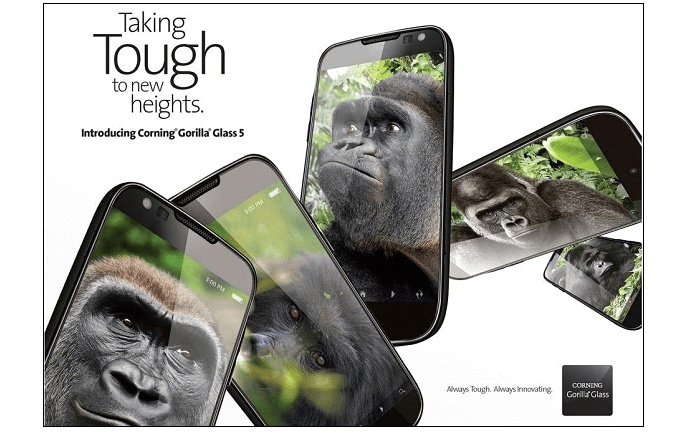 What is the difference between the different Gorilla Glass 1 to 5? The innovation behind Gorilla Glass lies in the ion-exchange process — a scientific treatment of the glass surface to dramatically increase its toughness. 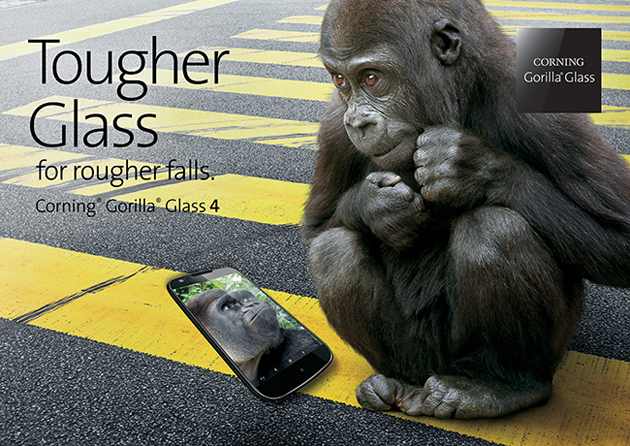 Gorilla Glass is a compressive strength glass. 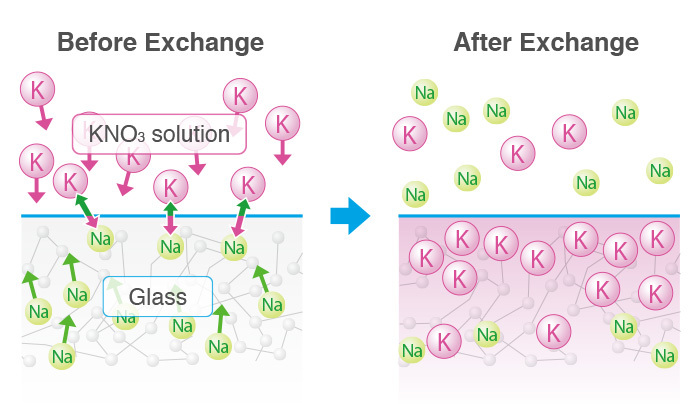 Due to the Ion Exchange, surface ions are replaced by bigger ions. This creates inward pressure which is same as the Prince Rupert’s drop. The strength of glass is managed by tuning the stress and tension. The image below shows the comparison by taking a cross-section in a normal glass and Gorilla Glass. Announced in 2008, it was thin, scratch resistive and hard without being fragile. It was a by-product of “Project Muscle” of the 1960’s which was restarted in 2005. Announced in 2012, it had 20% damage resistance than the previous version. This also implied thinner displays for OEMs adopting this version. Announced in 2013 at CES, this was arrived at by atomic scale study of bonding and interactions in Glass. Corning Inc. coined the term “Native Damage Resistance” to highlight the scratches which come from the tip of the keys while in the pocket. Version 3 is claimed to have three times more damage resistance than Version 2 of Gorilla Glass. Announced in 2014, version 4 was focused to address the damage caused by drops. When dropped from a 1-meter height on a rough surface, this version was found to survive sharp drop impacts “up to” 80 percent of the time and showed “up to” two times improvement over Gorilla Glass 3 and other hardened aluminosilicate glasses. Announced in 2016, version 5 again focuses on the issue of drops. When dropped from 1.6 meters onto rough surfaces, the device survived 80% of the time. This was the highest ever. This made it the toughest cover glass while delivering damage resistance, optical clarity and touch sensitivity. Announced in 2016, SR+ demonstrated superior scratch resistance while delivering up to 70% better damage resistance against impacts and 25% better surface reflection versus alternative materials. These improvements enable longer battery life and improved outdoor readability. Other than ones listed above, there is an Anti-microbial Gorilla Glass. This is known to inhibit the growth of algae, mold, mildew, fungi, and bacteria because of its built-in antimicrobial property which is intrinsic to the glass and is effective for the lifetime of a device. Anti-microbial Glass is produced by incorporating silver ions (Ag+) as the anti-microbial agent into Gorilla Glass 3. Small amounts of silver ions attach to the glass surface to eliminate the surface bacteria. This product is registered with US Environmental Protection Agency (EPA). With the advent of OLED & AMOLED based devices, Corning Inc. had a product offering for the segment. This was known as Willow Glass. These are flexible as compared to previous mentioned Gorilla Glass. In laminate form, they are 8 times harder times than plastic. As mentioned earlier that a significant number of devices are using Corning Inc.’s proprietary Gorilla Glass but with time there has been a steady rise in competition from other players in the market with equally innovative products. I would briefly like to mention them without going into their technicalities. Sapphire Glass by GT Advanced Technologies etc. Coating Solutions by Schott AG et.al. 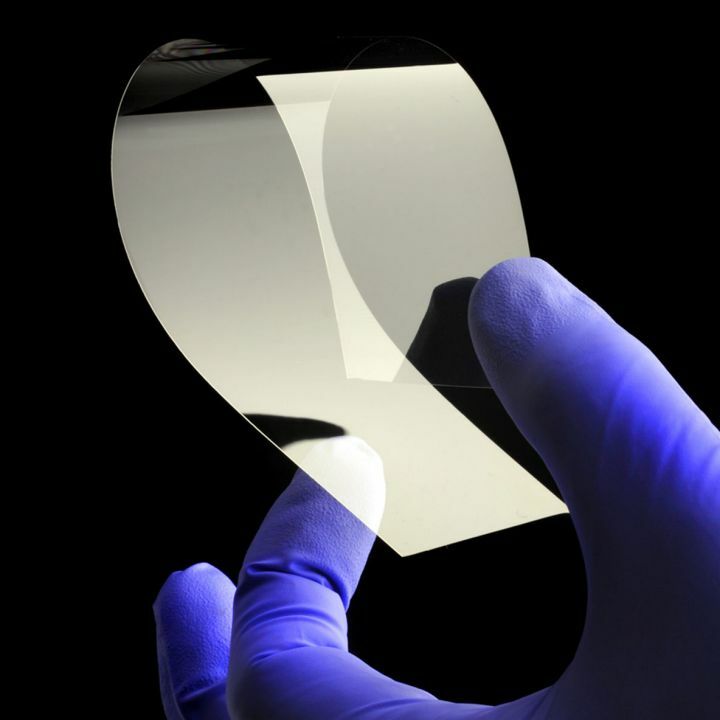 The next big innovation for Corning Inc. would be to develop a technology similar to the sapphire glass while keeping its cost effective for mass production. Here I have tried to give an overview regarding Gorilla Glass and its different versions over the years. Google Tez….Just another UPI app? Think again……. What does a small cylinder in laptop charger stand for? To know more, read on…..